Kids playing with snow. Two boys in very warm clothes in tall white snow throwing snowballs and playing. Winter time. 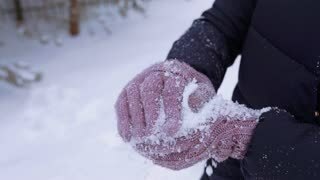 Happy cute playful little Caucasian girl in winter clothes looking at camera then throwing snow in the air slow motion.